As I look back at our business over the last few months it seems we can’t list property fast enough because we’re selling our inventory quickly. When you’re busy and having a good month it’s sometimes easy to lose track of the overall market. This is one of the reasons we’ve always studied the market to spot trends. I’ve spoken with agents over the years and asked them how they thought the market was doing. One agent would say it’s on fire when another agent would say it seemed down. I’d then follow-up and ask how their month was going and invariably the agent who said the market was on fire was having a good month and the agent who said it seemed down was having an off month. This tells me they weren’t studying the market but rather going by how their business was doing. It is human nature I suppose. People tend to justify the market by how they’re doing. If they’re having a bad month it must be the market. It’s easier to blame the market than evaluate everything you do, where you’re spending money, etc. We’ve been really busy the last few months and we wondered if it’s due to us working extra hard or if the market is doing well. It turns out both are true. We have been working really hard and the market is doing well. 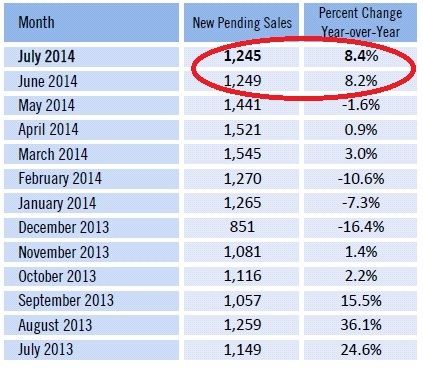 Pending sales are up 8.4% in July over last year and they were up 8.2% in June. 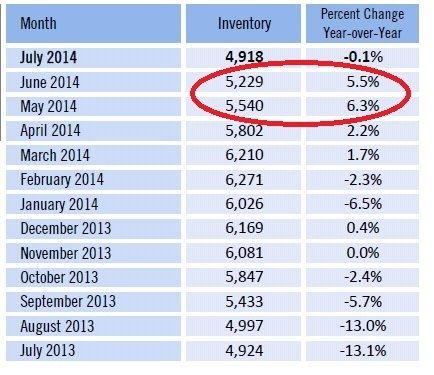 Pending sales are a direct result of what inventory is available. We’ve been saying for awhile there is limited inventory that is priced correctly. If it is priced correctly and marketed properly, it will sell.